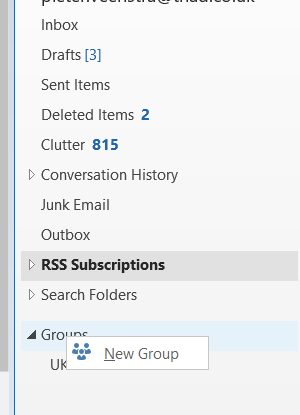 The one thing I hadn’t looked into very much is the new Office 365 groups. Office 365 groups give you a way to bundle collaboration related to a subject, client or anything else. 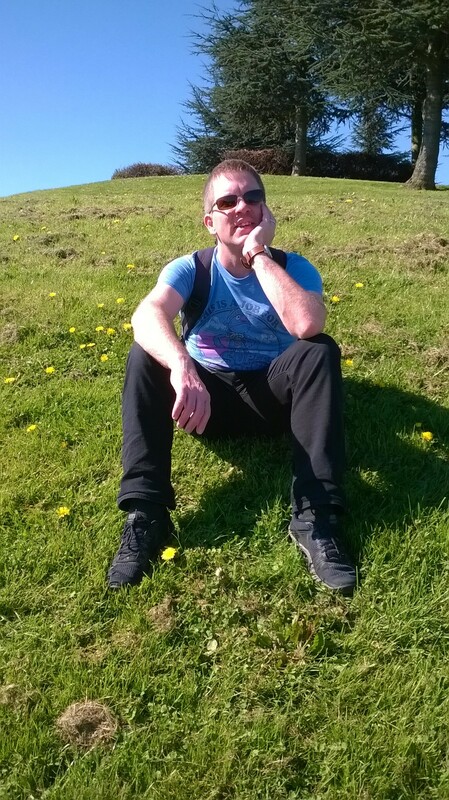 So it is a bit like a time site. But then it is a lot more than just a team site. In this post I’m going through the details. 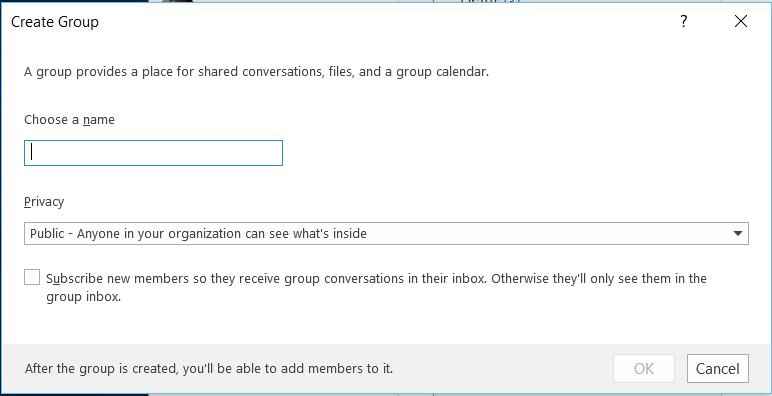 In outlook 2016 you can now see an overview of all the groups that you are part of. New groups can by created by right clicking on the Groups heading. After the form below is completed with a name of the group and privacy settings the group is ready to be created. There are two types of groups. Public ones and private ones. Next to the obvious difference, one very important difference between these to group types is that data from public groups is visible within SharePoint search. In outlook you can follow conversations and reply to conversation. All members of the group may receive a copy of the conversation. 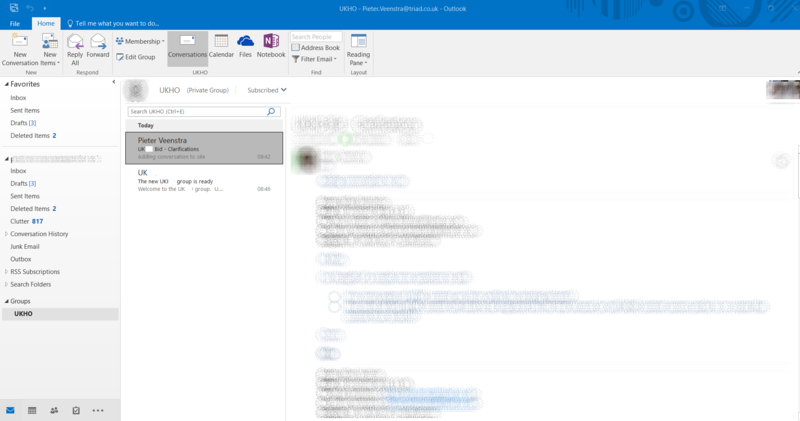 Within the ribon of outlook it is now possible to create a new conversations, to configure your group settings and check the group calendar, documents and notes. Within the group site documents, conversations, notes are all collected and presented similar to the traditional team sites. The delete option has been hidden away a little bit.Click on the site icon within the web version of outlook ( this is the same place where you could change your logo for the site). Then you will find the Delete group option in the settings dialog that appear at the right hand site. After a couple of confirmation screens you will have deleted the group site. 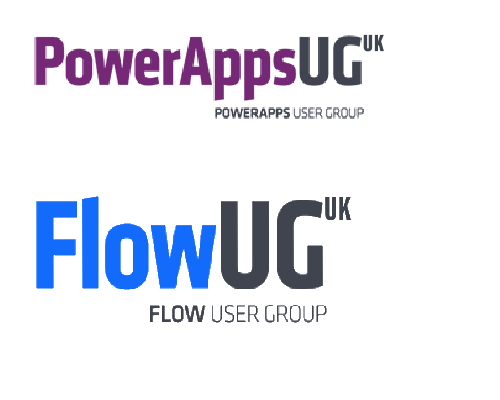 Once the group has been created many SharePoint developers may now want to know what can and what can’t be done. I quick glance at the site settings shows some of the limitations. So there are still options available to adjust the left hand navigation of the site, but there is no global navigation possible. There are still site collection columns and content types but no other galleries that we are used to in traditional site collection templates. Additionally it is possible to use a Content types hub. Within the site collection administration section Content type Publishing can be enabled. 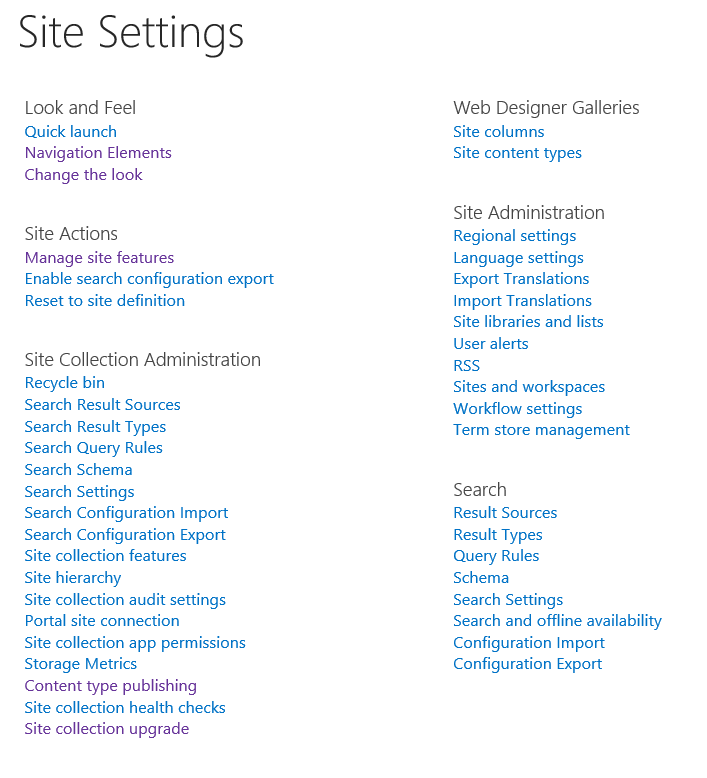 Additionally there are a lot of options available for search, however there doesn’t seem to be an option available to make search results from a private Office 365 group available on a SharePoint site. For public groups data is included in search. I also noted that the Portal site connection option still exists. Although when configured this seems to be ignored. The better option for this seems to be either the quick launch or the Quick links on the groups site landing page. Microsoft seems to be developing a lot of new templates all based on team sites and these team sites seem to be less and less connected to a portal/intranet. Each site seems to get its own identity. It will make it harder and harder for end users to still find the single place for information. A user will always have to consider where to store their documents. OneDrive, Office 365 groups or SharePoint sites. So far I have not found a way to pull Office 365 group data from private groups into SharePoint using SharePoint’s search or Delve. So it looks like we’re loosing the traditional intranets a bit. However for public groups data is included in SharePoint’s search results. So when yo create your groups be careful in selection private or public.